I was a little skeptical so I checked it out, and contacted the person who was supposedly making these, a fellow who goes by the alias HiCap on the AK47 message board. He informed me that yes it was in fact true, but I was still kind of skeptical so I offered to try a few of the designs out. I also asked how these magazines where produced to make sure they where legal, he cuts up sections of pre-ban magazines and attaches them together with pieces of sheet metal. 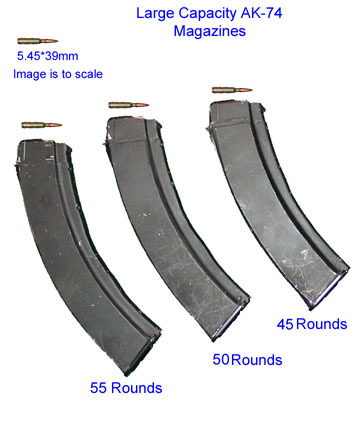 Basically, as HiCap puts it, you turn two pre-ban magazines into one large pre-ban magazine. UPDATE: HiCap no longer produces these so dont ask how to find them. They came packaged in a medium size boxed that was unmarked, a good thing because it keeps are curious friends at the shipping companies from "borrowing" things. When I opened it I noticed that there was plenty of packaging to protect from shipping damage, also each magazine was individually wrapped in factory packaging. Once I separated the magazines from the packaging I was amazed how good the magazines looked, they where seamless! They looked completely original, I was expecting to see seams from where the magazines where connected together but there was nothing. Next I brought out my SAR-2 and test fitted every magazine, they locked into place and released with no problems. A week later I loaded up all the magazines because the next morning I was going to get a chance to test fire them. Each magazine loaded up to the capacity as advertised, each round went in flawlessly. That morning I met up with some of the guys from the AK47 message boards for a small central Texas shoot. They where very surprised as I was that no seams could be seen on the magazine. I then loaded up the 55 round magazine and started to squeeze them off aimed shots as fast as I could, well at least until the owner came out and informed us we could not rapid fire. This kind of ticked me off because there where no signs any where and those that have been in the past where allowed to rapid fire. Regardless I got to cycle through all the magazines two or three times and they all functioned flawlessly with the except of two. 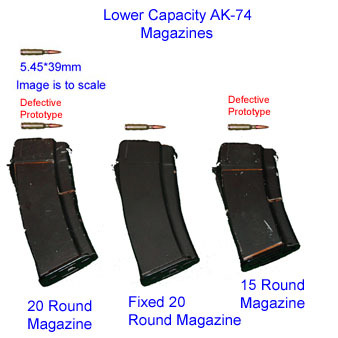 The 15 round and 20 round magazines developed a large gap, though even with this gap they functioned just fine. Upon returning home I informed HiCap the 15 and 20 round magazine had problems. Because of this he decided to not produce the any more 15 and 20 round magazines. HiCap mentioned that he had only produced them because a few people wanted them even after warning them that this might happen because the short magazines don't have enough surface space for the adhesives to hold together, but so far mine where the only ones to spit. (As of now NONE of his magazines have had this happen, and if they do split, or any other problem, he guarantees a free replacement). UPDATE: I was recently sent a Mark II prototype of the new 15 and 20 round magazines that are manufactured differently, I fully loaded them and let them sit for 2 weeks and they have not developed cracks, the problem appears to have been solved. please click here to sign my guestbook!